Sawant, an Ayurveda medicine professional has succeeded Parrikar, who died after suffering from pancreatic cancer for over a year. 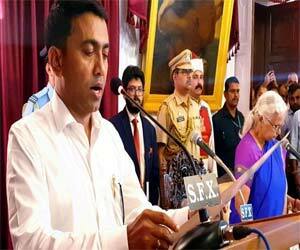 Panaji: Ayurvedic doctor Pramod Sawant is the new chief minister of Goa, succeeding Manohar Parrikar, cremated hours earlier with state honours. The doctor was sworn in at the late hours of Tuesday night. With this BJP managed to break the deadlock in Goa, offering key allies their pound of flesh, by accepting their demand for deputy CM’s posts. He holds a PG degree of Master of Social Work from the Tilak Maharashtra University at Pune. Sawant’s political career began in the BJP as a youth leader. A staunch Parrikar supporter, he had worked closely with the late leader. He won the 2012 and 2017 Assembly elections from North Goa’s Sanquelim constituency, which used to be a Congress stronghold. Sawant a Maratha by caste, in his political career has generally managed to steer clear from controversy and was handpicked by Parrikar to assume the Speaker’s post in 2017. Sawant, an alternative medicine professional has succeeded Parrikar, who died after suffering from pancreatic cancer for over a year. One hopes that alternative medicines, especially Ayurveda, will now get it\’s due recognition in the society.